There are those times in life when everything seems to be going well and Alice was nestled in one of them. She had her daughter, Julia, adopted during her first marriage, a child who was the light of her life. Alice had Michael, a man ten years her junior, who was lively, charming and complimented her lifestyle perfectly. Her job…well she had one and that was perfect too. Alice was just plain old happy and said to Michael, "This is the first time in years that I am truly happy!" Jewish folklore forbade such bold statements of happiness and superstition warranted that she "spit quickly three times through [her] middle and index finger--Tuh! Tuh! Tuh!" Absurdity and superstition weren't in her makeup. Was there something in that warning she should have paid more attention to? She was positive she had a tumor. The hard mass in her stomach was not going away, but her GYN saw nothing amiss when she did an internal. There was no way Alice could be pregnant. DES babies simply don't get that way, especially since her uterus was deformed and she was in an early menopause. Fine, there was nothing wrong with her, but the mass did not shrink. If anything, it began to grow almost imperceptibly and it now was a bulge. Dr. Riley sent her for an emergency CAT scan at Lenox Hill Hospital. When the scan results were known Julia began to question her own identity. Alice had no idea what she was going to do with a child who possibly had gender ambiguity. She began to create lists of what she knew because this unexpected pregnancy upended her world. Would she be able to get a late term abortion? Michael's tears of happiness soon turned to tears of grief. Tuh! Tuh! Tuh! This was an extremely poignant memoir of a woman who had to face choices she didn't quite know how to make. This book makes the reader ponder many ethical questions that society has difficulty dealing with, let alone a mother in crisis. The writing superbly echoed the hormonal upset and sometimes madness that a mother feels during any pregnancy. One fraught with the unknown and possible ethical dilemmas roils the waters even more. Questions about late term abortion, "wrongful life" and religious beliefs churn unanswered through these pages. There were opinions galore Alice had to think about when people would say things like, "Parenting is not about going backward…[it] is all about moving forward and constant, unpredictable change." Her list kept evolving from what she knew and later to what she didn't know or realize. What I know is that this is one amazing memoir you should consider reading! 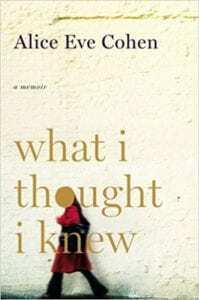 Quill says: This was an extremely poignant memoir of a woman who had to face choices she didn't quite know how to make!